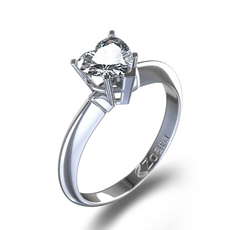 The ring that you choose as the symbol of your love and promise of commitment is a personal decision. Each woman has unique tastes and ideas on what the perfect ring should look like. 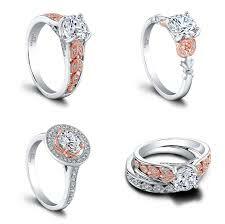 Many women choose simple engagement rings for their splendid beauty. Simple does not mean plain but instead it means a pretty design that is understated yet elegant. 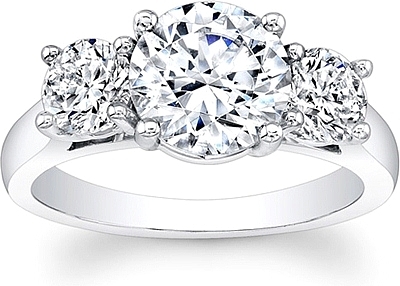 The timeless beauty of this type of ring will never go out of style. 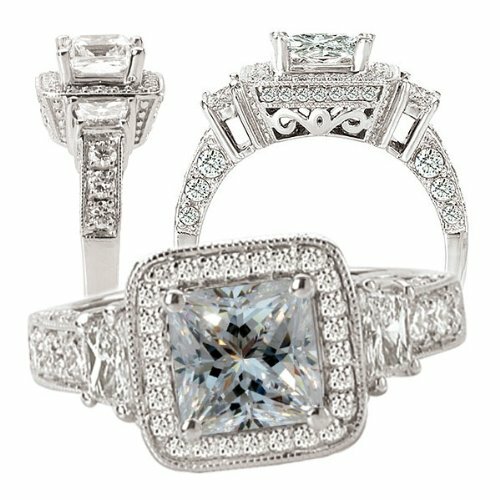 With the many types of cuts of stones that are available, each woman will find her own ideal ring. Most jewelers including online web sites carry a selection of rings with various stones making it easy to find that ideal ring. A romantic heart cut stone for your engagement rings is the ultimate symbol of love. A simple band is enhanced with a solitaire heart shaped stone. You can find diamonds as well as gemstones in the cut that will look lovey on a simple band of yellow gold, white gold, or rose gold. 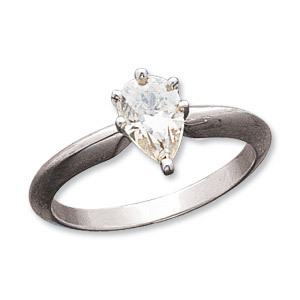 A prong setting holds the stone and shows it off. You can find a heart ring at Zoara web site. The trillion cut stone is more than a triangle shaped stone. This stunning cut uses a facet pattern that is applied to an equilateral triangle. Diamonds and gemstones in this cut will add charm to a simple design and produce a lovely ring. 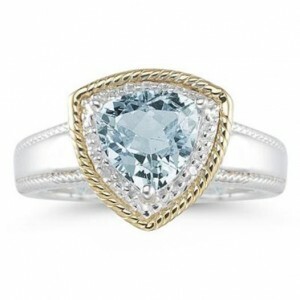 A pale blue aquamarine in a trillion cut with diamond accents on a classic band makes a striking ring. 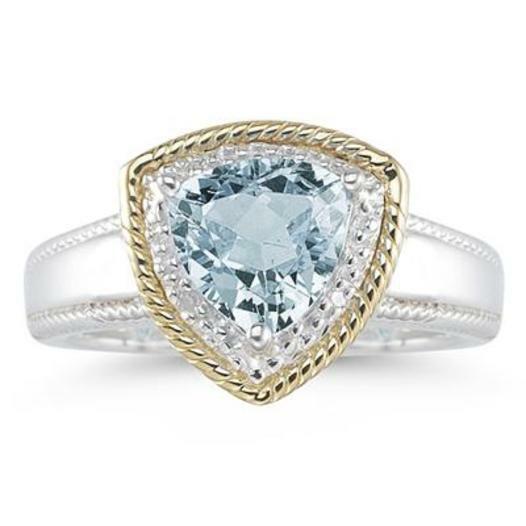 Sears carries gemstones including the aquamarine trillion cut rings in 14k yellow gold or silver. The sparkling asscher cut stone has a square shape that has a flat top surface with many small step cuts on the top edges. It has longer facets that reflect the light and shine. This cut features the bottom of the gemstone as an open culet design that gives the stone depth. A stone with this cut is unique and it will add elegance to any yellow gold, white gold or rose gold band. 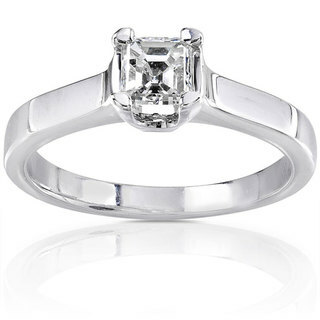 The Overstock web site has classic style rings with single asscher stones. One of the fancy cut diamonds is the radiant cut. This cut has a brilliant facet pattern on both the pavilion and crown for a diamond that is more dazzling than one with the simple emerald cut. One ring with a radiant cut stone is the Moissantie Solitaire Engagement ring in either yellow or white gold. The solitaire stone glitters brilliantly on the slim band and is available at the Bonanza web site. The emerald cut stone is a rectangle shape with some refractive brilliance. This cut of stone has elegance and grace. It is understated yet dazzles beautifully on a slim band making an ideal stone for a simple ring. 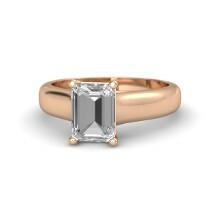 A solitaire emerald cut diamond on a warm rose gold band is a stunning ring. You can find this ring on the Gemvara web site. A popular cut of stone for rings is the oval cut. This cut is a modification of a round cut stone. The stone will be rounded with squaring at the ends. It looks lovely on slender, long fingers. A solitaire oval cut stone looks beautiful on a band of any color. A Moissanite oval cut stone on a white gold band is a stunning simple engagement ring. You can find a ring like this on the Bonanza web site. A pear cut stone is referred to as a teardrop shape. The stone has a wider and rounded bottom with a narrow top and has an elongated shape. It is a combination of the marquise and oval shapes. A solitaire pear cut stone can make your fingers look slimmer because of the shape. A 14k white gold band with a solitaire pear shaped Moissanite is striking. 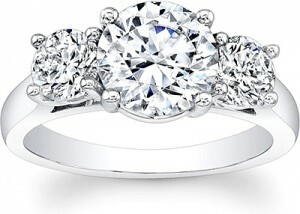 A six-prong setting holds the stone securely in place. The dazzling ring is available on the Joy Jewelers web site. The princess cut stone is a popular choice for engagement rings. This cut has a square or rectangular shape and pointed corners. The pretty cut has looks lovely on any color of band. 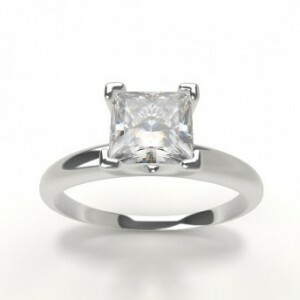 A solitaire princess cut on a 14k or 18k white or yellow gold band glitters on your hand. It gives a modern look to the traditional ring and the McQueen Jewelry web site carries this ring. A marquise cut stone is similar to the oval cut. It has pointed ends that should match and a rounded center. 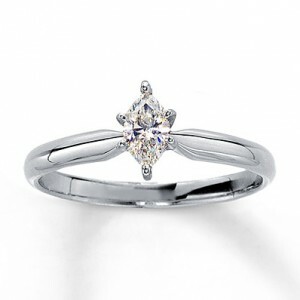 Most marquise cut solitaire stones have a six prong setting with one prong on each tip to protect them. A sparkling solitaire marquise 14k white gold ring is enchanting as a simple ring. Kay Jewelers carry this ring as well as their web site. 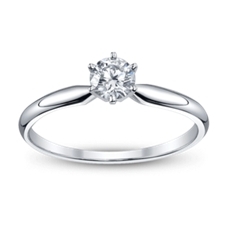 The most popular stone cut for a solitaire ring is the timeless round cut stone. The traditional cut has a shape that has the most light saturation so your diamond has a higher level of shimmer. This cut of stone looks stunning on any color band. This traditional solitaire simple engagement ring has a sparkling round center stone on a shining band of 14k white gold. Most jewelers including Robbins Brothers web site have this classic ring.